One man’s campaign is another man’s institutional public relations and information service. The “Venezuelan Heart” PR campaign, which was launched by the Chavernment last May has been withdrawn for now. 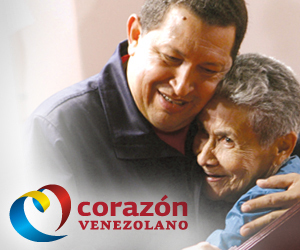 “…possible confusion between this campaign and the electoral campaign of Hugo Chavez for reelection (titled “Heart of my Fatherland)“. You don’t say… Wasn’t that the whole idea behind this in the first place? This gesture of Chavismo contradicts its prior rejection of a pact proposed by opposition candidate Henrique Capriles to respect campaign rules, after the use of cadenas and other State advertising for electoral purposes. This sudden decision looks to be a possible unilateral compromise to please both the CNE and the opposition. Who knows what forced them to change their minds? Could it be this image?